If you were a child of the ‘80s, Teddy Ruxpin probably blew your mind the first time you saw him chatting away. He was one of the earliest animatronic plush characters you could actually own (without robbing a Chuck E. Cheese’s) and quickly became one of the best-selling toys of all time. Now he’s back, with upgraded capabilities and a more expressive face. This will actually be the fifth version of Teddy Ruxpin released since the first version hit toy shelves back in 1985. The original relied on audiobook cassette tapes, jammed into Ruxpin’s back, that automatically triggered mouth movements. The bear’s mouth moved along to the sounds and kids thought he was talking. Primitive technology by today’s standards, but mind-blowing to kids who didn’t grow up with smartphones. The new version of Teddy Ruxpin, now owned by a company called Wicked Cool Toys, features some noteworthy upgrades over the original. The classic cassette tapes which are all but impossible to find anymore have been replaced with 4 GBs of onboard storage that can hold somewhere around 40 different stories at a time. It also connects to a free accompanying smartphone app over Bluetooth and can not only download new content, but to also allow kids to read along with an interactive book that stays synced to what Ruxpin is saying. YouTube’s MommyandGracieShow got an exclusive demo of the new Teddy Ruxpin, which actually won’t be available until 2017, showing the improved animatronics of the toy. 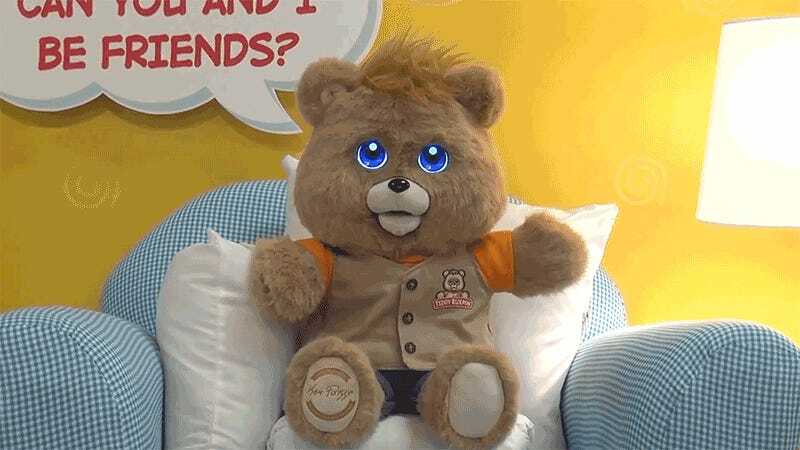 Gone are the toy’s moving eyelids, and eyes, replaced with tiny round LCD displays showing full-color animations of Teddy blinking and looking around. It adds to the believability of the character, but also less moving parts means there’s less parts to break. Teddy Ruxpin’s hands can also be pressed to change stories, making it easier for kids who aren’t quite old enough to use a smartphone or tablet to interact with the new toy. As for Teddy’s old pal Grubby, there’s no word on whether or not he’s getting an upgrade.